The report titled "Vietnam Online Advertising Market Outlook to 2023 - By Medium (Desktop and Mobile), By Type (Banner, Video, Search, Social Media and Online Classifieds & Others Digital Advertising), By Sectors/Industries (FMCG, Healthcare, Entertainment & Media, Retail & E-Commerce, Automotive, BFSI and Others)" provides information on overview of the online advertising market in Vietnam, Vietnam online advertising spending overview from 2013 to 2023 , Vietnam online advertising market segmentation By Medium (Desktop and Mobile), By Types of Advertising (Banner, Video, Search, Social Media and Online Classifieds & Others), By Sectors/Industries (FMCG, Healthcare, Entertainment & Media, Retail & E-Commerce, Automotive, BFSI and Others) and by Pricing Models (Cost per Mile (CPM), Cost per Click (CPC) & Cost per Action (CPA). The report also covers competition landscape, trends and developments, issues and challenges, value chain analysis and government regulations pertaining to the online advertising market in Vietnam. The report concludes with future outlook and certain recommendations highlighting the success factors for entering and expanding in the market. This report will particularly help the readers to identify the ongoing trends in the industry and anticipated growth in future depending upon changing industry dynamics in upcoming years. The report is useful for Ad networking companies, Advertising companies, industry associations, government and regulatory authority and publishers of ads. The online advertising market in Vietnam is currently in its growth stage. The overall advertising market in Vietnam is being dominated by the traditional channels of advertising such as television, newspaper, magazines and radio. The online advertisement market is expected to grow due to the increased use of smart phones and higher internet penetration in Vietnam. 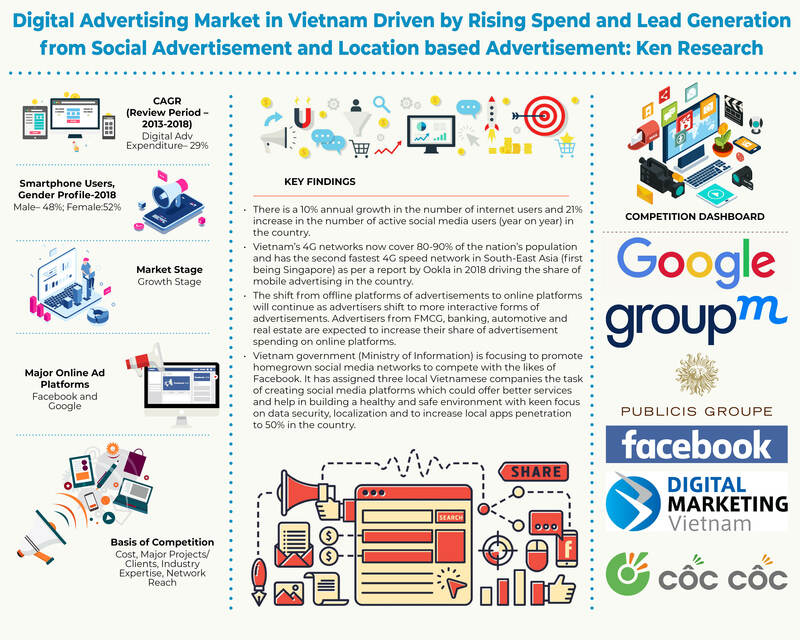 The online advertising market in Vietnam witnessed robust growth between the years 2013-2018 driven by innovative technologies to understand the consumers’ needs better. In addition, rising trend of using social media, e-commerce market and improved internet infrastructure have amplified the growth of digital advertising in Vietnam. In the past, desktop dominated the advertising market owing to better resolution of the advertisements and bigger screen. In addition, the internet broadband speed available in Vietnam is faster in any fixed connections as compared to the internet speed connections via mobile phones. However with the advent of strong internet infrastructure owing to Vietnam government’s initiatives and rapid increase in smart phone penetration in the country, mobile advertising took a whole new meaning and changed the game of online advertising in Vietnam forever. Among the five types of digital advertising, social media has the maximum market share due to the higher usage of social media for messaging, calls, online payments and many more activities. In social media, Facebook messenger and Zalo accounts the maximum user penetration followed by Instagram, Skype, etc. Video advertising ranks 2nd in terms of market share in online advertising in Vietnam due to the 99% video ad completion rate prevailing in the country. Search advertising has seen a stable growth in the last five years whereas banner and online classified advertising have seen a slight decline in this period. FMCG is the top sector which spends a lot on its product and services advertising owing to high market competition and low product switching cost followed by the healthcare sector that is coming up with innovative medical services and need to raise awareness among consumers. Entertainment & media also have a significant share in online advertisement spending in the country with digital games, online music having the highest visibility. E-commerce is an upcoming sector in Vietnam that will grow at a very fast growth rate owing to increase in personal disposable income and shift towards online shopping from traditional brick and mortar model. Automotive and Banking services also accounted for a considerable market share in the digital advertising market spending in Vietnam. The CPM (cost per mile) model is being widely used by publishers in Vietnam because the financial risk is low in this pricing model. However, the CPC (cost per click) and CPA (cost per action) model are going to overtake the CPM model because these pricing models are more result driven for the brand/advertiser. The online advertising segment is witnessed to be concentrated with few major advertising agencies serving the majority of the brands. Companies compete on the basis of promotion strategies, their networking, major clientele and the platforms used for digital advertising. Some of the major players operating within this segment include GroupM, Publicis, Digital Marketing Vietnam, Dentsu, Mirum, CleverAds, PHD Media and others. Major platforms with majority of the share in the market are Facebook and Google, followed by Zalo and other platforms. Pricing, brand value as well as advertising strategies adopted by a particular company are considered as of high importance in order to reach a wider target audience in the country. The Vietnam online advertising industry is forecasted to have a CAGR (2018-2023) of approximately 21%. Due to the availability of software that could measure ads reach and optimize the monetization rate, the future of digital advertising market in Vietnam would witness a significant growth in its digital advertising expenditure. Moreover, the Vietnamese government is coming up with the cyber security laws that will protect the privacy data of the end users and will focus on data storage localization. This will result in advertising companies, investors and other advertising agencies to streamline and to innovate online advertisement strategies in the country. In addition, Vietnam is working on improving its internet infrastructure by making more investments in undersea cross-country cables which will connect different regions in Southeast Asia.